Mon., June 18, 2018, 12:18 p.m. 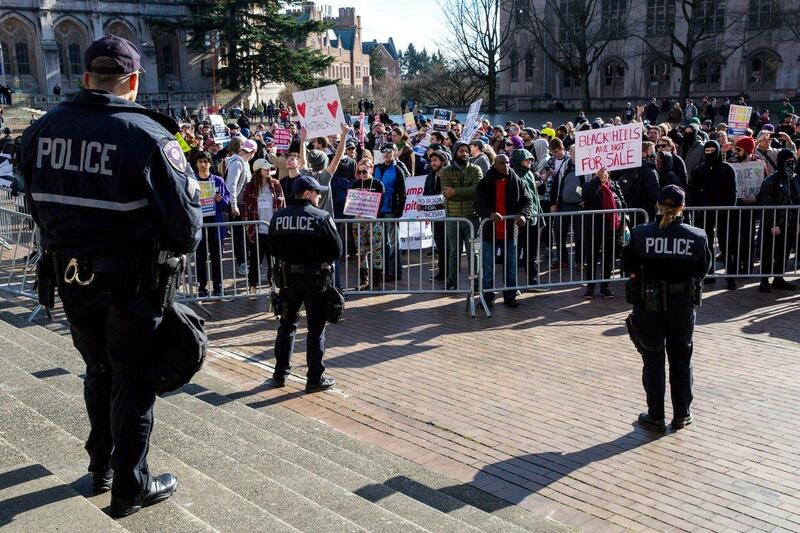 The University of Washington has settled a lawsuit with the UW College Republicans club over $17,000 in security fees the university planned to charge the club for holding a rally Feb. 10 with the conservative group Patriot Prayer. The College Republicans argued that the security fee unconstitutionally infringed upon their First Amendment freedom of speech rights by making it unaffordable for them to host events that could lead to violent protests. Twenty-three law school professors signed a letter earlier this year asking UW President Ana Mari Cauce to settle the case, saying that assessing substantial fees to a student group could have the effect of squelching unpopular views, and runs counter to the First Amendment. In their lawsuit, the College Republicans argued that they and other politically conservative campus groups were being discriminated against when the UW charged “exorbitant event fees to provide increased security needed to thwart violent protests from leftwing political activists,” according to a statement by Freedom X, a California nonprofit law and advocacy firm that defended the club. According to the settlement, UW will pay Freedom X $115,000 and the Seattle law firm Ellis, Li & McKinstry $7,500. The UW never collected the $17,000 fee. The day before the rally, U.S. District Court Judge Marsha Pechman issued a temporary restraining order, blocking the UW from levying the fee. Pechman said that the guidelines of how the bill was calculated ran afoul of the First Amendment, and could have the effect of chilling speech. During the Feb. 10 rally, both Patriot Prayer supporters and counter-protesters clashed repeatedly, and several people were arrested. The law school professors wrote that the UW’s security fee was calculated based on the fact that Joey Gibson, the leader of Patriot Prayer, had been assaulted at previous rallies and threatened with death. “The fact that Mr. Gibson had, because of his actual or perceived views, been the victim of prior criminal attacks and threats is a particularly unseemly basis for charging a student group for the cost of protecting him while on campus,” they wrote. They underscored that they were not writing in favor of rescinding the fees because they agreed with Gibson. “The protections of the First Amendment are not limited to liberals, or conservatives, or people with good ideas,” they wrote. Published: June 18, 2018, 12:18 p.m.